At the beginning of the year I came across a reader’s letter in Runners World. The writer had read this book after seeing an associated article in the magazine in 2013 and said it had improved his running time. Obviously attracted by this claim, I hoped it might additionally provide some clues on how to meditate because that’s something I have never managed to master. At yoga classes, however much I try, my brain always starts to wander back to day to day life during the relaxation period rather than through the meadows or babbling brooks it is supposed to be transported to. Even if I try to concentrate on my breathing, my brain is still very busy elsewhere! So I purchased my own copy. Just several pages in I was already thinking about writing a review. Although I still haven’t mastered the art of meditation, the book did strike a few running related chords. 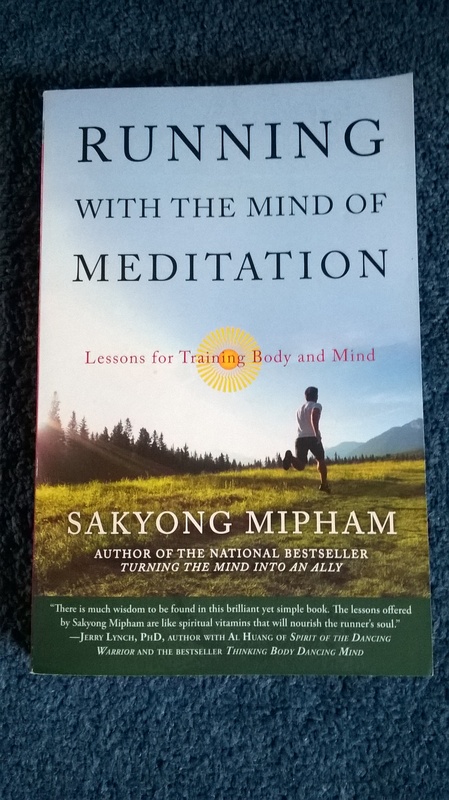 But after spending the Bank Holiday weekend rereading the book, I realised that Sakyong Mipham has so much to say, that in trying to get everything across, my review would probably be longer than the book itself! So I have decided to pick out just a few particularly pertinent points to me. Even so, it’s still a long review – you have been warned! If you get to the end, though, I have listed a few quotes which I found both inspirational and insightful. I would thoroughly recommend getting hold of your own copy, paper or e-book, published by Three Rivers Press. After my initial read, one of the thoughts that particular stood out for me was the idea that pain is temporary. This is a phrase which I now often repeat to myself whilst out running, particularly towards the end of a long run or even parkrun. I’m glad to say it does help! It’s also a phrase I’ve repeated to other people. But when I came to reread the book, I couldn’t find that expression anywhere! There’s a whole chapter on pain but those words do not actually appear. Sakyong Mipham does, however, suggest that rather than ignore pain or allow it to derail our endeavours, we should “acknowledge” it but not “overreact”. I’m assuming that if you’ve fallen and broken a bone then the reaction would be slightly different but I get the gist of it. When he speaks about pain, he makes reference to when he ran his first marathon and ended up with a massive blister on the sole of his foot. This was as a result of the rain and his decision to wear brand new socks – I can hear the groans from runners everywhere. Safe to say he learnt his lesson on that score – never use new gear for a long run, you’re only asking for trouble. He also speaks about embracing the elements and listening to what is going on around you. This has helped me no end, particularly when it comes to running in the rain. (Although I am writing this just before venturing out for a Running Buddy client session and I am not looking forward to it – it’s raining!) If it’s raining on a Saturday morning, I no longer turn off the alarm and go back under the duvet. I jump out of bed and turn up for parkrun. I have also stopped looking at the sky before I venture out on a solo run. If I get wet, I get wet. It’s nothing a hot shower wont solve. I’d like to think the book has influenced me in that respect. Sakyong Mipham urges us to leave music behind and although he acknowledges it can be helpful, he says “ultimately it challenges our ability to be present and embodied.” I’ve always been one who thought it would be impossible to run without music but again, thanks to his words, I now rarely go out with my iPod and instead listen to what is going on around me. It also seems to garner you more respect from other cyclists and pedestrians, acknowledging that you are aware of your surroundings rather than running in a noise bubble. And with more and more organised runs becoming “no music” events, perhaps it’s just as well. I could never remember what I’d listened to when I got back from a run anyway so picking up on bird song and the breeze running through the trees has become my “running music” of choice. Although the distant hum of the motorway traffic is not quite the same as the noises of the Colorado “countryside”! The majority of the book concentrates on the four phases of running which the author says can be reflected in the four phases of meditation – the Tiger, Lion, Garuda and Dragon. These four phases represent the “inner development of a courageous individual”, the idea being to “develop balance and integrity”. And he points out that although these phases are progressive, they are also all-inclusive, “all of these concepts are interdependent”. The first phase, the Tiger, is about building a base. I can see how this applies to meditating as well as running. You start from small beginnings, just a few minutes, and as you get stronger, you find yourself able to meditate or run for longer. The Tiger “is friendly to himself ”. Something all newbie runners should be. Without building a base, you’re only heading for trouble – injury! The second phase, the Lion, “is associated with joy”, “we are proficient runners” “not struggling as much anymore, so the runs are enjoyable”. This I acknowledge and accept. However, when Sakyong Mipham also speaks of throwing away our watch and heading out the door “With less concern about how many miles we run or how fast our intervals are, we enjoy nature, the streets, and being alive.” This I have a problem with! On this basis I’m not sure when or even if I’ll ever progress from the Tiger phase purely because I find it very hard to envisage leaving my Garmin at home. The ideology of just running for running’s sake is very noble and something to aspire to but if you’re training for a run, surely you have to know what distances/times you’re doing to keep up with your training schedule. I also fear that if I don’t set myself running goals in terms of distance, my motivation to get out the door might rapidly diminish. The next phase is the Garuda, a mythical eagle-like bird. Once into this phase, we should be competent and accomplished; now in a position to challenge ourselves because we are ready to “go beyond our comfort zone”. This is a term many runners or other sports people will recognise and which he says may simply mean running further or longer than you normally do. Sakyong Mipham uses the term “outrageous” throughout this section of the book but actually means awesome not reckless. It also seems to me he arguably contradicts himself in this section when he acknowledges that although running is “essentially a goal driven sport”, in this phase we should be running without goals and ambitions because at this level it does not matter. The final phase is the Dragon. “We are no longer running for ourselves, but to benefit others”. While he acknowledges that this could be perhaps through raising sponsorship monies, it could also be down to doing something like pacing or encouraging others at parkrun or any other run. In the chapter about Motivation, one particular chord was struck with me. He speaks about setting smaller motivations if you’re finding it difficult to motivate yourself. He points out that if you set out with a smaller motivation to say run twenty minutes, not only would you feel successful once you’d achieved that time but you might also feel motivated to run further. I recognise that completely. Many times I’ve gone to the gym or for a run and said I’ll just do an easy run/session and then gone on for a lot longer. The satisfaction once you’ve finished is immense. As previously mentioned there are a few parts I have issue with, such as when Sakyong Mipham speaks of “consciously letting go of any other activities, plans, or concerns” to enjoy the run and its benefits. This seems contrary to what we are so often told about running being a time to sort out the stresses in your mind! It is, however, a book I shall keep coming back to. It also inspired me to read Sakyong Mipham’s earlier text, “Turning the Mind into An Ally”. Actually I have still not finished this book. It stays by my bed with just a few pages left to read because I am reluctant to finish it just yet. I do, though, feel another review is forthcoming! I thought I was having a good running week until I watched a BBC News documentary on the Marathon des Sables. It was only half an hour and hidden away on a Sunday evening on the news channel. But it was very awe inspiring. Although not too inspiring – I have no intentions, ever, of trying that one even if I could get a place! All that sand, everywhere! But back to my running week. After a few weeks of little and sometimes painful running (although to be fair the pain was usually felt after the running rather than during) I’ve managed some reasonable distances this week. This has been especially reassuring as its now only eight weeks until the Royal Parks Half. I am now following training plan version 6.3(b), revision 5 AKA the “desperate and running out of time” training plan! Originally I thought after the Paddock Wood Half back in March it would be relatively easy to keep up the high mileage (for me) runs during the spring/summer and then I would be raring to go by October. Hmmm, oh well, best laid plans and all that! So I now have my weekly long run distances set out and my aim is to get them out of the way as early as possible in the week and this week was no exception. Another reason for trying to do them as early as possible is that if/when I fail, I hopefully have another opportunity during that same week to try again! This week’s plan was 13k and I came back from an early morning client session raring to go. And went! The run wasn’t very exciting but my ankle played ball. I managed to cover the distance in a reasonable time and only had to stop when a twig got caught in my shoe. I did try running through it but that damn twig didn’t want to leave me. Not until I stopped anyway, then it immediately detached itself and decided to wait around for some other unsuspecting runner. I wouldn’t mind if I’d been out in the sticks (sorry for the pun) but this was on a residential road. When I got back I obviously stretched, rehydrated and refuelled but I would say planning your long run for the same day as you have a Running Buddy client session in the evening is not a particularly sensible idea. Somehow I survived and the next day I was still able to walk. No run was on the cards for Tuesday but another photo shoot session had been arranged. 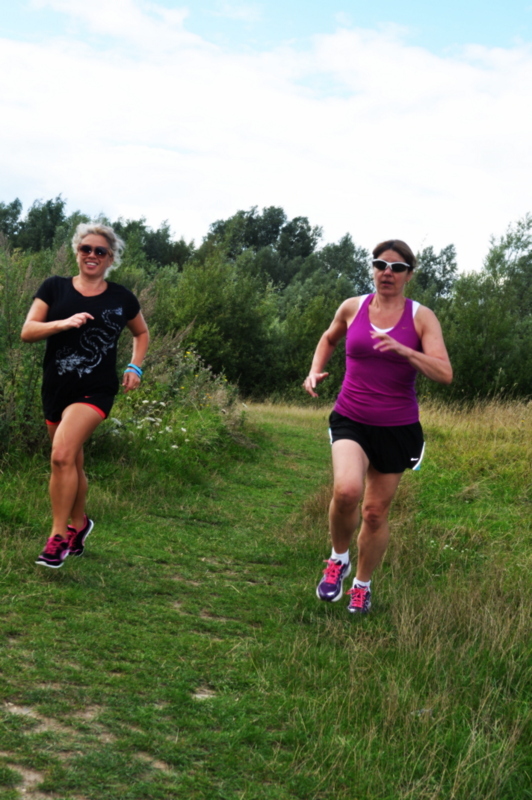 Fortunately this time at Leybourne Lakes where there is no jetty to jump off but I was instructed to be coiffed and presentable and wearing my running gear. I think our session lasted about an hour and a half this time and the photos covered running, jumping off banks (? ), sitting on a bridge in a very unladylike fashion, press ups and dips on a bench, swimming and cart wheeling. Yes, you read that right – cart wheeling! For some unknown reason I decided I wanted to see if I could still do a cart wheel. It must be at least several decades since I last tried this and I don’t know what came over me but I decided to give it a go. And I managed it without falling flat on my face, back or any other part of my anatomy. Mind you, I did discover a few more muscles I never knew I had. And just to “share”, here are a few other photos from the shoot for your entertainment! 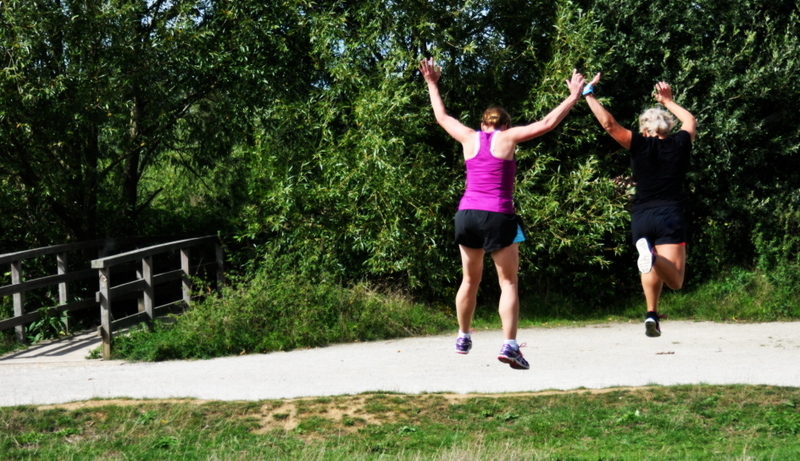 Anyway, the next day I had very sore Achilles and I can only assume it was as a result of all that jumping – or more likely all that landing heavily! As a result, the short run I had planned didn’t happen and I decided to postpone and try for a longer run the following day. During my recent runs I have reverted to my “old” Mizuno trainers and that seems to have eased my ankle problems but they are not going to last forever. In fact they already have a large hole in them so I decided that for Thursday’s run, I would try the “new” Mizuno trainers (new as in I’ve had them a year!). This was a bit risky if I wanted to do any sort of distance but I decided to give it a go and as I set off, there were no signs of discomfort and only a couple of times during the run did I think maybe I had made a mistake. So amazingly I managed 10k and I am so pleased – it felt more like a normal training run than a “long” run and I haven’t been able to say that for a few years. So I am taking comfort and reassurance from this. This morning saw me turn up for parkrun number 43 – only another seven to get my 50 t-shirt 🙂 and again, I used the “new” trainers. Fortunately they didn’t seem to hamper me on this occasion either and I got one of my faster times of recent runs. So tomorrow I have it in my head I might try for another 10k, just to see if Thursday was a fluke. It would also be the most weekly mileage (can you say, kilometerage?) I’ve done, ever, if I did! The last couple of weeks have been quite lean in running terms. A dodgy ankle has kept me off my running feet although I’m glad to say that changing back to my old trainers seems to be keeping the problem at bay. Just as well really as its only 8 weeks (or 55 days as a Running Bug friend informed me) until my next run, the Royal Parks Half Marathon. 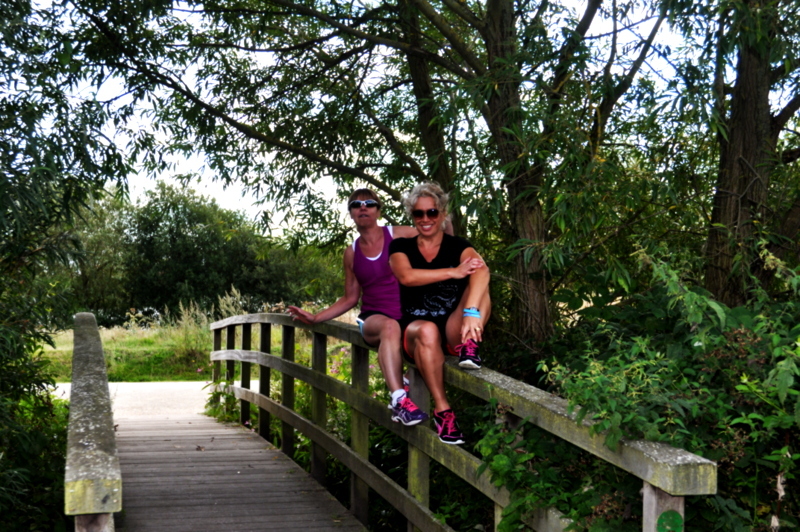 In the meantime, last week, in preparation for the launch of our new fitness/lifestyle blog, a friend and I had a ”photo shoot” at Holborough Lakes. One of the shots we were after was of the pair of us jumping off the jetty into the water below. It’s not something I’ve done before during our visits although I have seen Alex do it frequently. I’m more of an ungainly crawl and slide down the slipway kind of gal! Yes, just like a boat! Although a boat would look more elegant!!! Anyway, it was not something I was particularly looking forward to doing but I was fairly confident I could join in. We did a location assessment (?!) to try out different viewing options and then had to go and change ready for the feat itself. It was a bit chilly that day so the thermal swimwear was required. Is it really August?! I know the lake drops away quite quickly and is I’m told around 11 metres deep by the jetty but when I looked over the side, I just couldn’t jump. I’m not sure if there’s a link with my growing fear of heights or just the fact I couldn’t see anything in the depths below. Whatever, it was a no go from me and as a result I felt like I’d let everyone down, including myself. 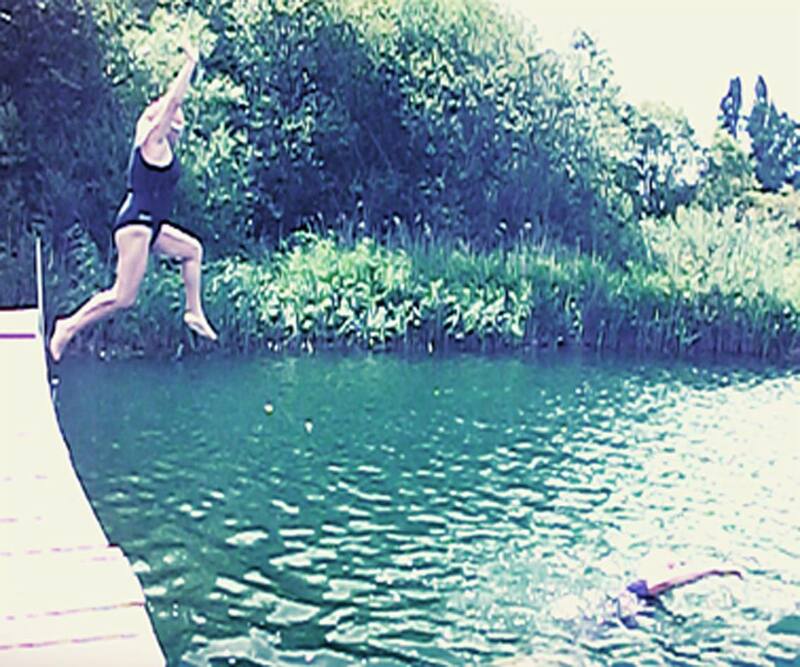 Having decided that I couldn’t jump, the decision was made to try for a picture of me already in the water ostensibly swimming while Alex did a solo jump. 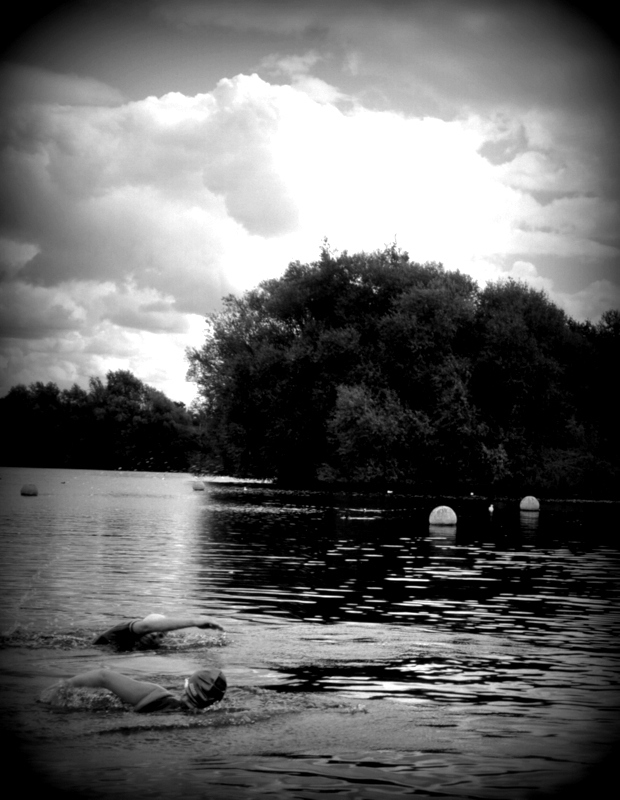 The impression intended was that I had already done the deed and was off on a quick circuit of the Lake. I think the result looks more like Alex is jumping in to try to save me as I drown! What do you think? But I am determined to crack this. My plan for my next visit to Holborough is to sit on the jetty and launch myself off from that position. Then hopefully I can progress to a crouching jump (dive bomb stylie) and then grit my teeth and jump from a standing position. After all, look what I’ve discovered today. The London River Rat Race! Hope they run one in 2015 because if I can jump off that bad boy, I can do anything! So after last weekend’s achievement by Steve Way, this weekend we “oldies” have a new hero in the form of Jo Pavey, showing that age is no barrier. At 40 (41 in September and with a ten month old baby) she took bronze at the Commonwealth Games 5,000m – in case you didn’t know! Jo led for a lot of the race but in the final lap where it looked like it would be a clean sweep for the Kenyans, she found an extra surge on the home straight and crossed the line in third, only narrowly missing out on a silver medal. It was while she was on the home straight that I found myself shouting at the television (not that this would have helped her)! Usually when one of our (English/GB) athletes is performing well I find myself forgetting to breathe but I don’t usually get vocal! As it became clear that she could get a medal, the Hampden Roar was amazing and as many athletes have said, the reaction from the crowd really does give you an extra push. My other inspirations at this weekend’s Commonwealth events included Julius Yego from Kenya who taught himself to throw the javelin by watching YouTube and won the gold medal despite injuring himself during warm up. And Matthew Dixon, who looks about 8 but is in fact 14, who competed in the Men’s 10m Diving final alongside Tom Daley. He’s one to watch for the future surely. But don’t worry, I don’t intend to take up diving or javelin – (a) I don’t like heights and (b) me with a javelin would just be dangerous! My own sporting achievement this week has been to “play” (and I use that term very loosely) tennis for the first time in probably 35 years! Now the technique needs a bit of honing – we need to stop allowing the ball to bounce more than once between strokes and a bit of attention is required to ensuring the ball stays within the court – but we did improve over the course of our two sessions. This week sees my first “yoga for runners” session which I’m really looking forward to. I’m just hoping I’ll be bendy enough to execute some of the positions!